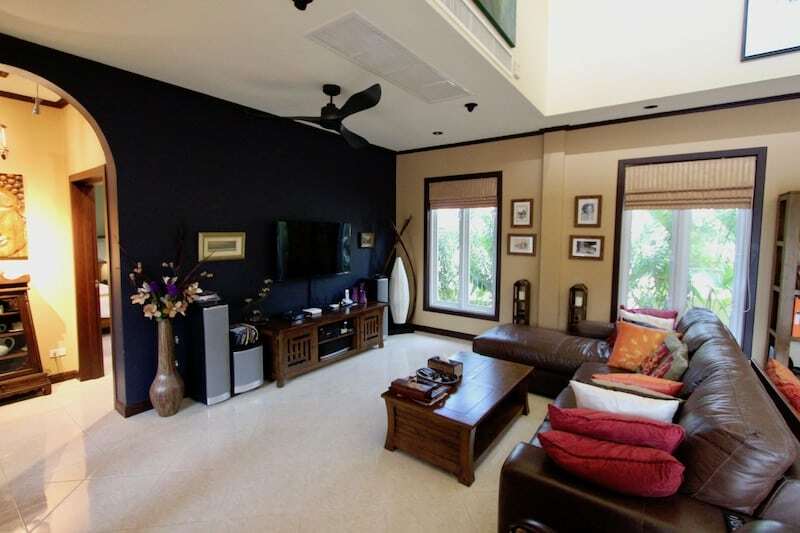 This is a fantastic opportunity to own an beautiful, recently remodeled Bali style pool villa at a price well below market value. 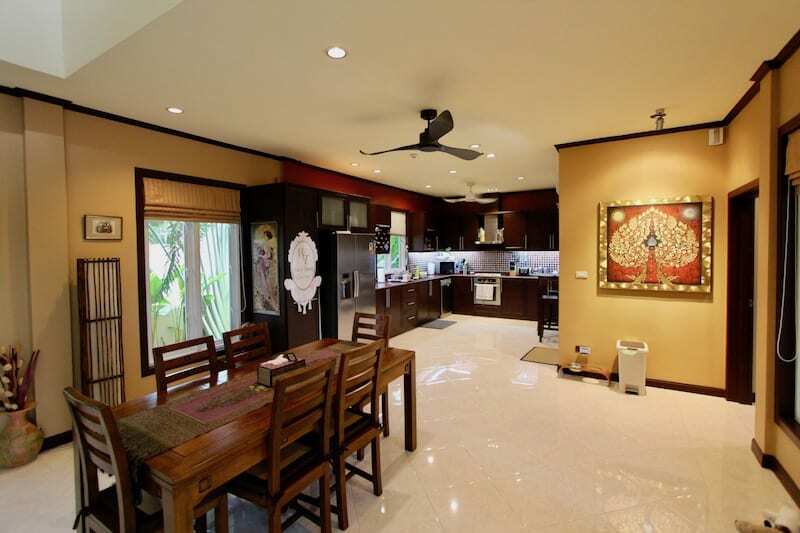 The home offers a superb combination of contemporary interior with high quality, modern finishings and a Bali style exterior, which suits the surroundings and tropical lifestyle perfectly. 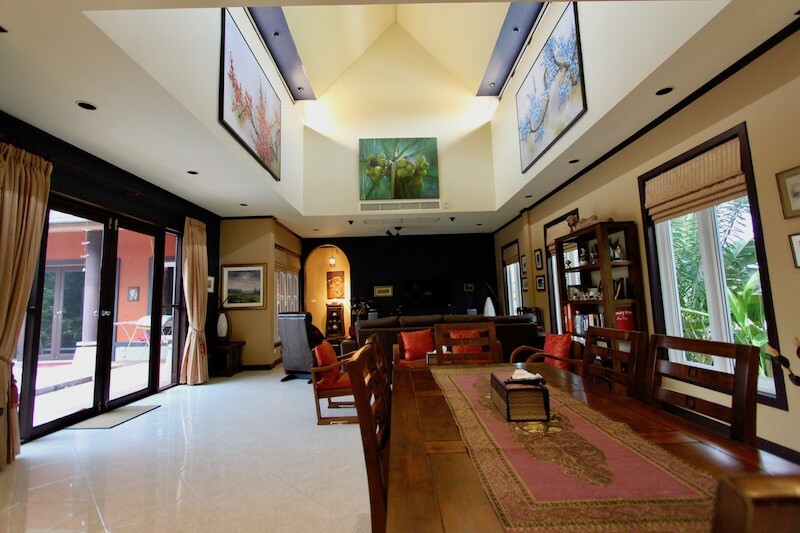 Upon entering the property, one immediately notices the gorgeous cathedral style ceilings in the large living room. The ceiling provides a cheery brightness thanks to the height and additional windows, and also better ventilation and cooling. 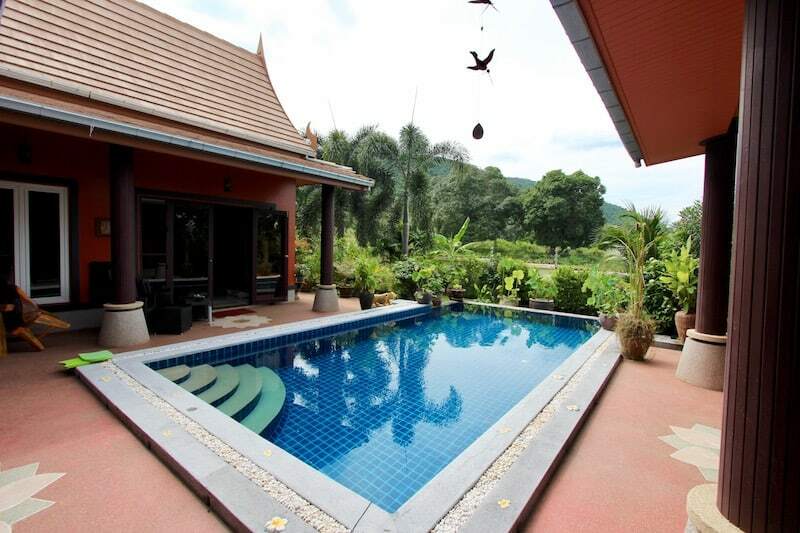 There are lovely wood French doors leading onto the covered terrace and pool area with mountain views beyond. 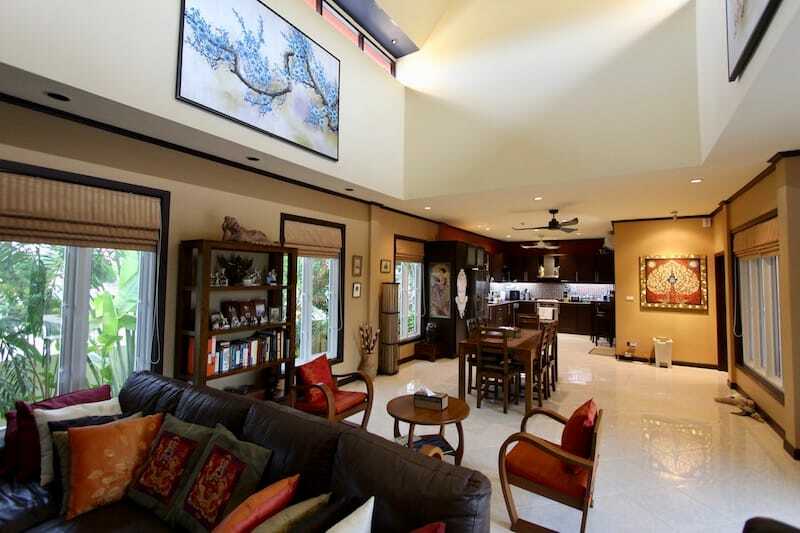 The living and dining room are open plan and flow seamlessly to the modern kitchen. The kitchen has granite countertops, wood cabinets, high quality appliances, plus a new double fridge/freezer and new dishwasher. 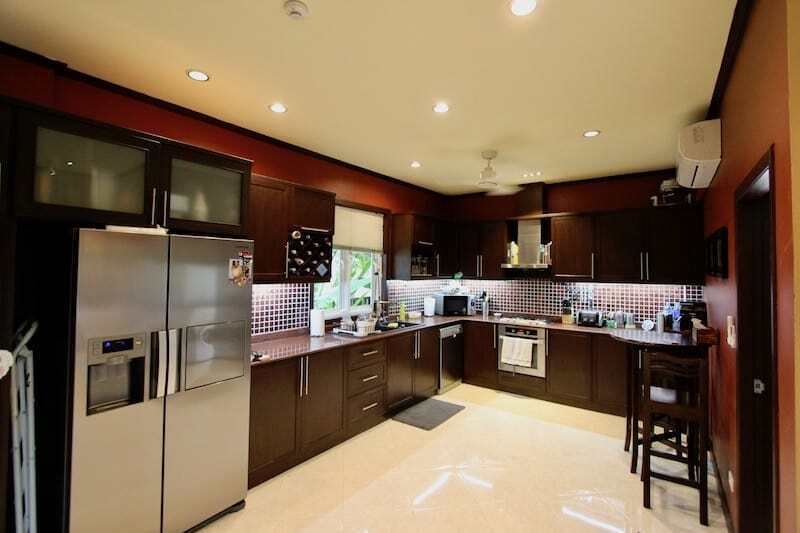 Directly behind the kitchen is the utility and laundry room which houses the central water heater, the electric panel, another set of cabinets, the washing machine and a sink. 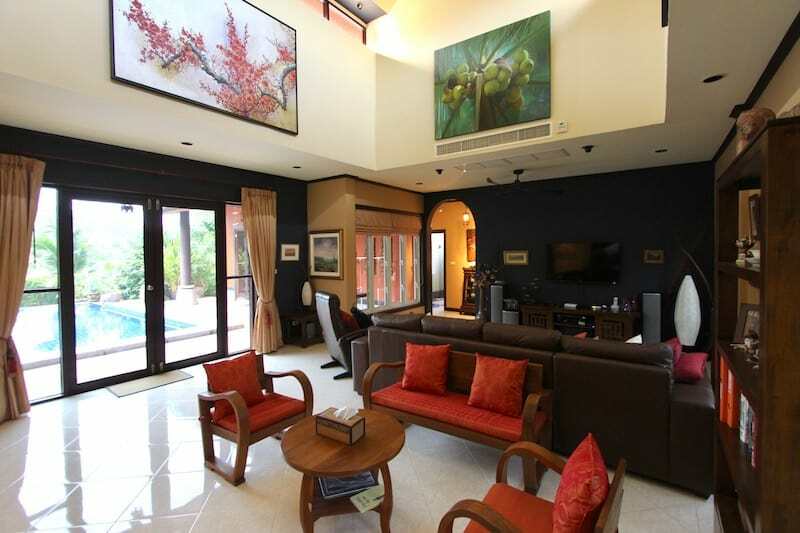 The home has a lot of storage throughout, both internally and externally, a feature which is often overlooked but vital for anyone living full-time in Thailand. 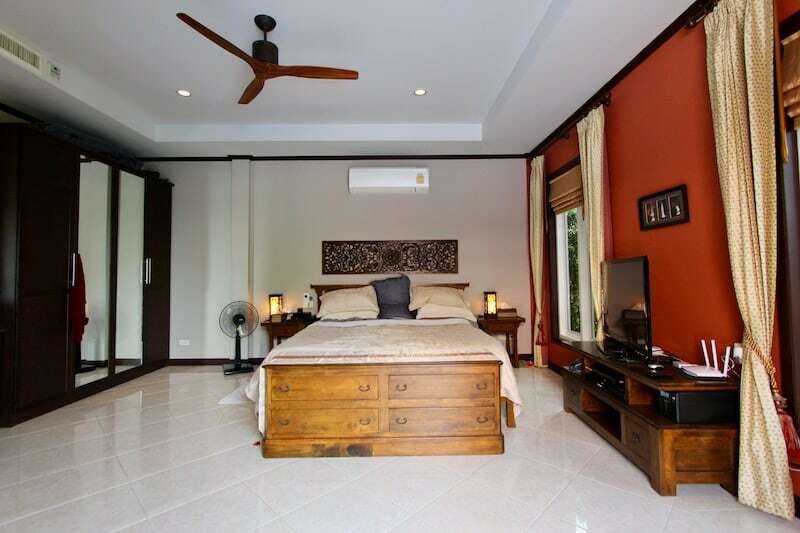 The master bedroom is on a separate wing of the house for added privacy. 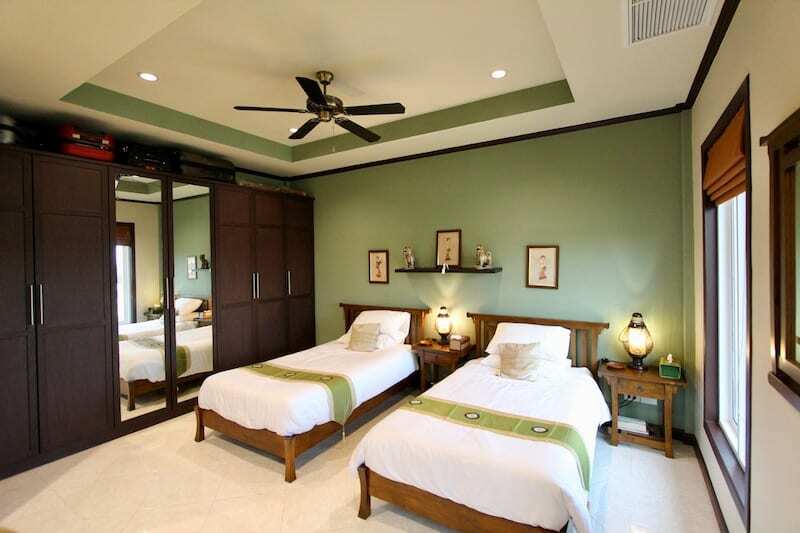 The master suite consists of a cheerful and spacious en-suite bathroom with bathtub, and a large master bedroom with built-in wardrobe and granite-topped desk/dressing table and large mirror. 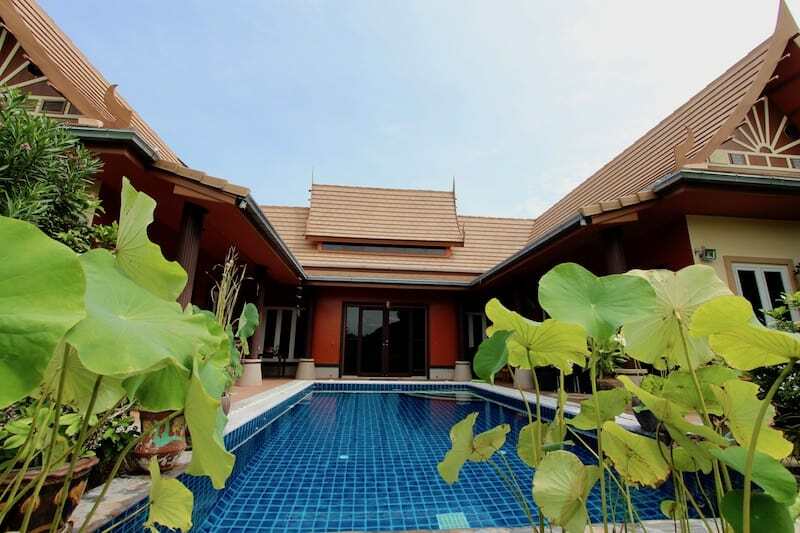 There are wood double doors leading directly onto the covered terrace and swimming pool, and the windows are high quality, energy efficient UPVC. 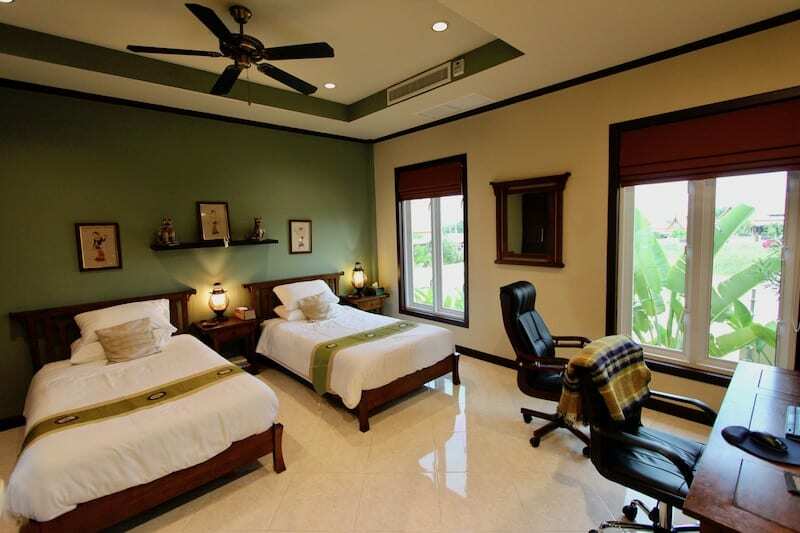 All windows and doors enjoy lovely Thai silk curtains and shears with energy reflective lining. The guest bedroom also has wood French doors and UPVC windows, a built-in wardrobe with large mirrors, and an en-suite bathroom. The third bedroom functions as both a guest room and an office, and there are twin beds, built-in wardrobe and a large desk. 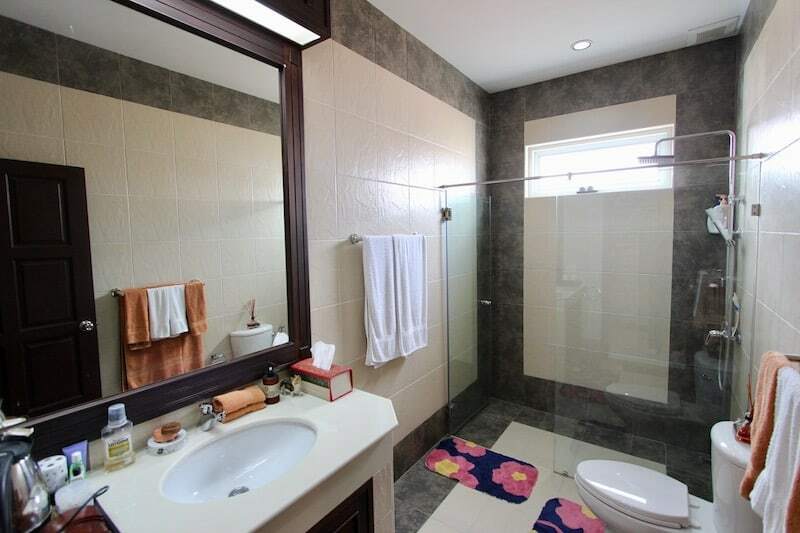 Adjacent is the toilet which services this room, and also functions as a toilet for guests. 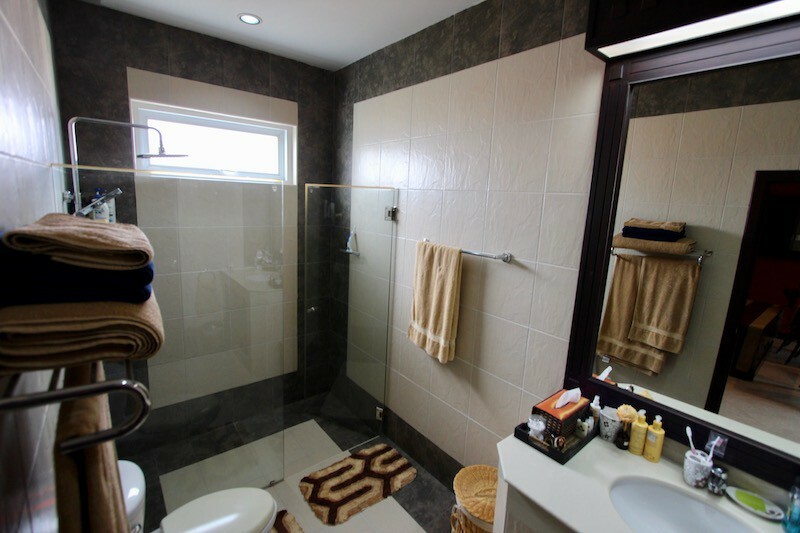 The property has just had a series of major upgrades, both cosmetic and functional, and the home is now in impeccable condition and is super energy efficient. The seller is an internationally acclaimed Energy Conservation Engineer, and all of the upgrades have improved the efficiency of the home and significantly lowered the operational costs. 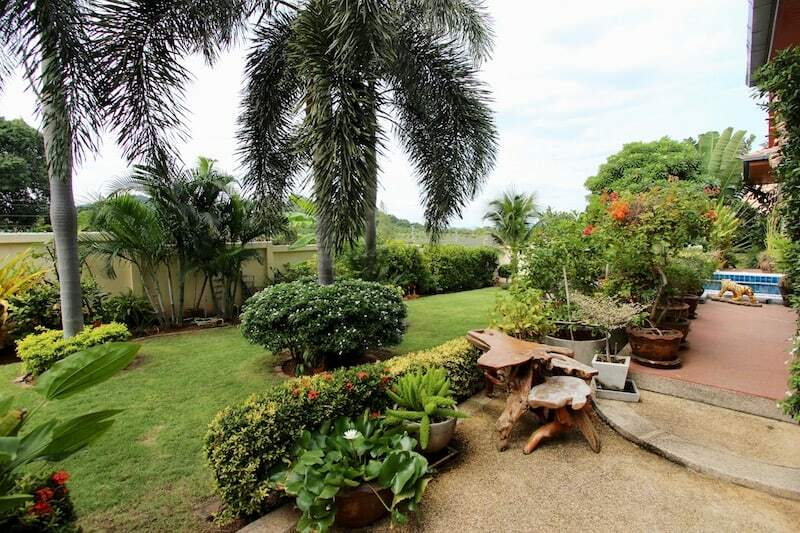 The nearly 900 sqm plot has the best view within the development, thanks to the highest elevation. 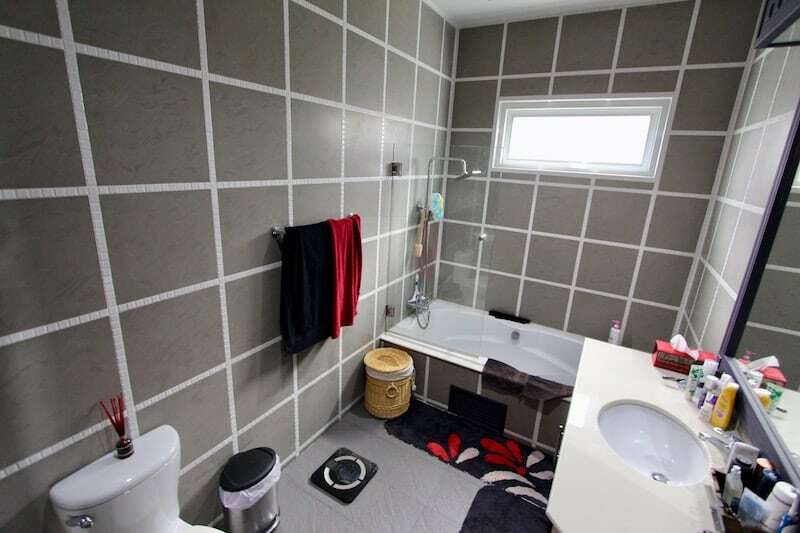 The property enjoys the most privacy and is not overlooked by any other home. The spacious garden is lushly planted with mature trees, shrubs and a healthy lawn, all of which provide both a gorgeous atmosphere and also help with keeping the home cooler throughout the day. 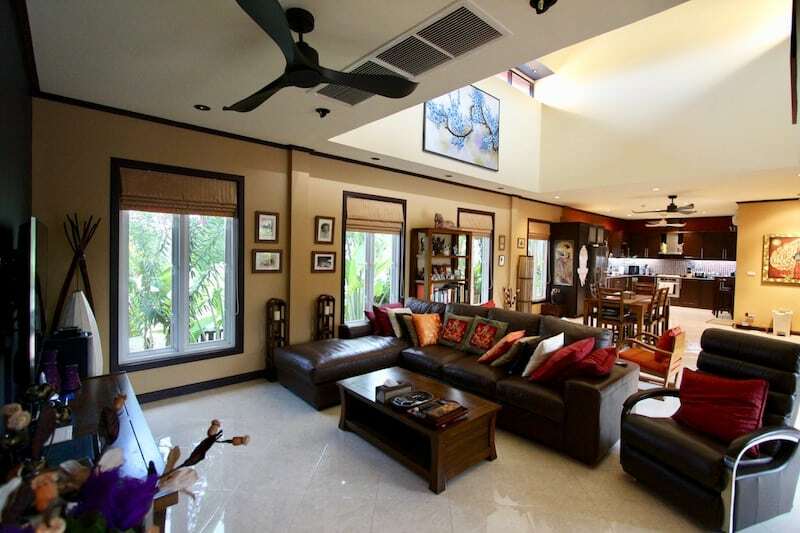 The home has a covered carport with enough room for a large car and several motorbikes. Additional parking on the street is allowed, thanks to the wide roads in the development. 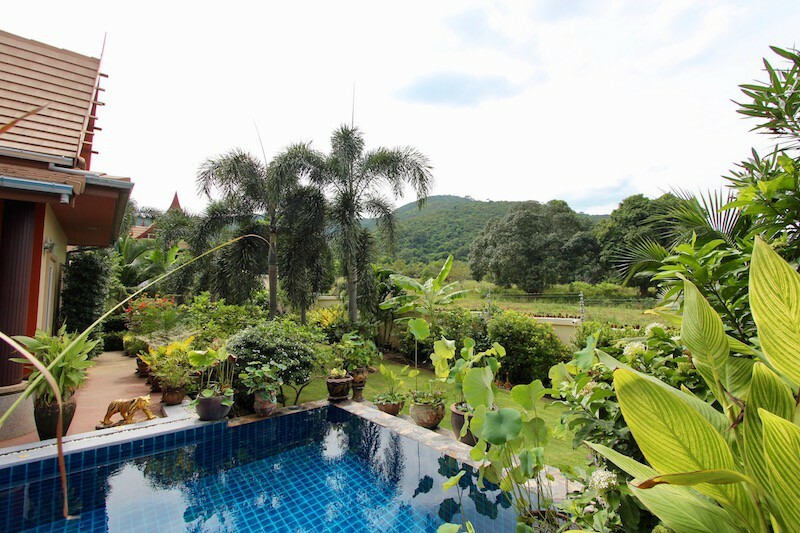 The property is located in Pranburi, nestled against a stunning backdrop of mountains, which provide both lovely views and consistent breezes throughout the day. 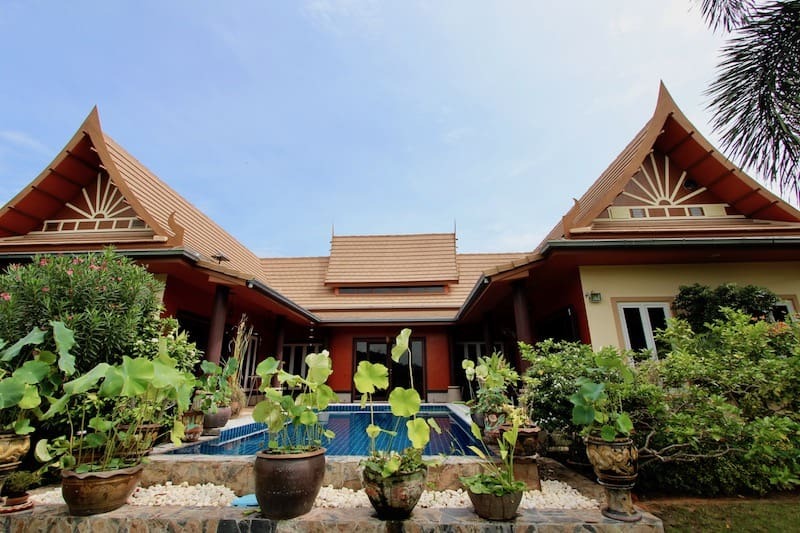 The area is quiet and beautiful, and close to the Pranburi Dam and only a few minutes from the Tesco Lotus Pranburi and all modern amenities. The beautiful beaches of Pak Nam Pran, Kao Kalok and Dolphin Bay are about 10-15 minutes by car.